Think back a year ago. Remember one of the popular story lines from spring football 2016? It was Nebraska's recommitment to the run. The Huskers played smashmouth football in the Foster Farms Bowl win over UCLA, Mike Riley said he wanted Nebraska to be top-three in the Big Ten in rushing immediately afterwards and thus it became a talking point for the next eight months. It was better as a talking point than it was in practice. Nebraska ran it 40.2 times per game in 2016, up from 38.2 the year before. Those two extra carries per game were really Tommy Armstrong's. Take out quarterback runs, and Nebraska ran it 30.3 times per game last season and 30.1 times per game in 2015. And the Huskers got worse, ranking 10th in the Big Ten in yards per carry and ninth in yards per game. "But the offensive line was decimated by injuries," you might be saying. I've said it plenty, but a recent data dump from Bill Connelly of SB Nation might force us to rethink that part of the equation. He recently posted individual rushing stats for 2016, which includes two numbers worth thinking about as it pertains to Nebraska in 2017 -- opportunity rate and highlight yards per opportunity. This is the percentage of carries in which the offensive line "does its job" and produces at least five yards of rushing for the runner. (Generally speaking, the first five yards are considered the line's responsibility, the next five are split evenly between the runner and the line, and anything over 10 yards is all on the runner.) See Highlight Yards and Adj. Line Yards for more information. So highlight yards are then everything (on a slightly sliding scale) a rusher gains beyond the initial 5 yards, and highlight yards per opportunity are those yards divided by the number of chances a rusher had to gain highlight yards. Got it? Good. The average opportunity rate in college football last year on running back carries only was 38.05 percent. That's how often the line "did its job," a phrase I don't particularly like because it omits the fact that there's another entity (the defense) actively trying to prevent that, but it's not that big of a deal. Nebraska's offensive line, in all its injury-ravaged glory, was a little better than average in 2016 at 38.44 percent. That ranked fourth in the Big Ten behind Ohio State, Maryland and Michigan. Highlight yards, however, were a different story and this one is mostly on the running backs. Nebraska averaged just 3.81 highlight yards per opportunity, the only Big Ten team at less than four and thus last in the league. When a Husker run hit the 5-yard threshold last year those runs only continued for 3.81 more yards. National average here is 5.36. Maryland's Ty Johnson had the best average (12.39) of any back with at least 100 carries. Is that worth considering as it pertains to Nebraska's current position battle? It might be. 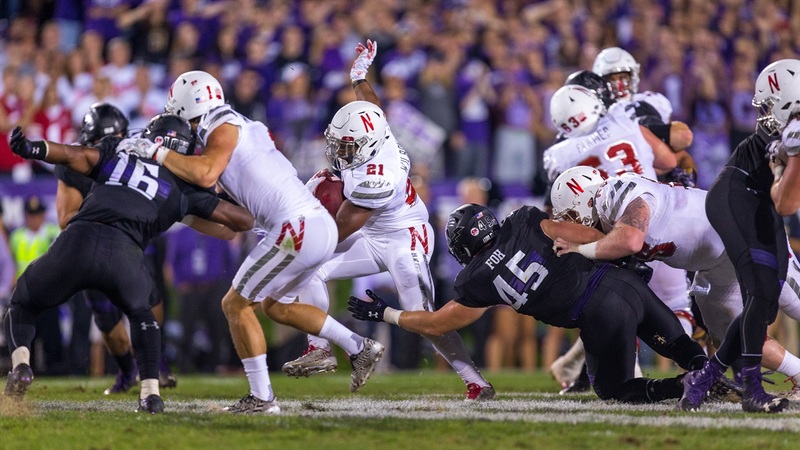 There are not a ton of surprises there with the Huskers' returning backs. Ozigbo had the highest percentage of opportunities for highlight yards, but that's not his strength. Bryant had the lowest rate of opportunities but proved a little more elusive than Ozigbo. Then there's Wilbon. His attempts were pretty limited so the sample size is small enough to give you pause, but here's paper proof of what most Husker fans have seen from Wilbon the past couple of years -- he has some big-play potential. Could he maintain that highlight-yards rate over an entire season? Maybe 2017 is the year we find out. Great read on Nebraska bowling from the New York Times. Great photos, too. Pro Football Focus breaks down Jordan Westerkamp's strengths and weaknesses as a pro prospect. Memphis men's basketball has had four players leave the program this offseason, prompting a statement from the university's athletic director. ICYMI: Nebraska baseball picked up another win over Kansas State last night. Also, Bob Diaco gave some pats on the back to a few specific Huskers last night. Never miss the latest news from Hail Varsity! There are not any replies to this post yet.